No visit to the Korean Peninsula is complete without a tour of the demilitarised zone or DMZ – the 250 kilometre strip of land that separates North and South and acts as a de facto border barrier. It was where I found myself on Day Two of the Korean Foundation programme with 28 other media representatives from other parts of the world. The media delegation moves on to visit the Changduk Palace in Seoul City before flying to Jeju Island. Jeju Island is also declared world heritage site and was also voted world’s seventh-most beautiful place. The visiting delegation will attend the Jeju Forum media session on Korean unification and the role of international media. The DMZ is 44 kilometres or an hour drive from Seoul and winds 241km (155 miles) across the Korean Peninsula from East to West, dividing South Korea from North Korea. The media delegation had to go through a series of identity and security checsk before the entry to Camp Bonifas, which leads to the joint security area (JSA) headquarters. Camp Bonifas was a United Nations Command military post located 400 metres south of the southern boundary of the Korean Demilitarized Zone. It was 2400 meters south of the military demarcation line and lies within the Joint Security Area (JSA), also known as Panmunjom. Camp Bonifas was home to the United Nations Command Security Battalion – Joint Security Area, whose primary mission was to monitor and enforce the Armistice Agreement of 1953 between North and South Korea. 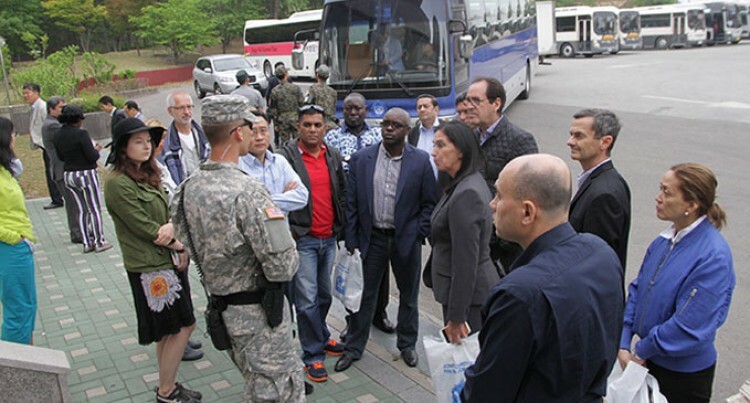 Republic of Korea and United States Forces Korea soldiers (known as “security escorts”) conduct the United Nations Command DMZ Orientation Programme tours of the JSA and surrounding areas. The camp, formerly known as Camp Kitty Hawk, was renamed on August 18, 1986, in honour of U.S. Army Captain Arthur G. Bonifas (posthumously promoted to major), who along with 1Lt. Mark T. Barrett (posthumously promoted to Captain), were killed by North Korean soldiers. The Military Demarcation Line forms the border between South Korea (the Republic of Korea) and North Korea (the Democratic People’s Republic of Korea). It was returned to the Republic of Korea in 2006. The visit to the Joint Security Area (JSA) at Panmunjom is the entrance into a hostile area and the possibility of injury or death as a direct result of enemy action. The JSA is neutral, but divided and guarded by United Nations Command Military personnel on one side (South) and the Korean People’s Army on the other (North). Visitors are not allowed to cross the Military Demarcation line. South Korean (ROK) soldiers provide close security to visitors at JSA, which oversees the border of North Korea. The media delegation was constantly reminded not to take photographs until permitted as most of DMZ is a no-photography zone. Live recordings or interviews are strictly prohibited. South and North Korea have seen 21 family reunions post-Korean war. The family reunion only involves South Koreans visiting the North. By far around 1000 families have taken part in the family reunion programme.